I’m quite partial to a bit of lipbalm. Right now in my handbag I have three different ones, just in case I may leave one behind and have to face a whole tube journey without a bit of shiny stuff. I always seem to be buying them and always seem to be losing them. While I was in the enormous queue in H&M the other day (why do they only ever have one person serving at a time?) I started perusing that area by the till where they keep all the tat they want you to buy when you’re bored. Normally I wouldn’t dream of picking up a pair of socks or random hair clip, but something twinkly caught my eye. H&M have been working with Hello Kitty for some time now and seem to have branded everything going, from hair bands to shower gel. I actually bought my friend’s little girl a collection of their stuff for her last birthday – she attempted to use the pink lipgloss as blusher, but who am I to judge. 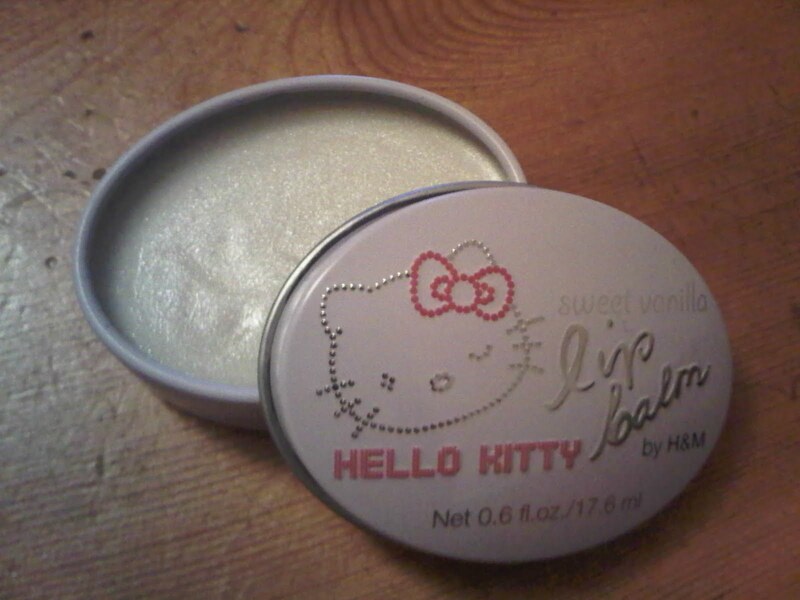 I hate girly, kitten type stuff, but this lipgloss was surprisingly cute, classy and a little bit retro. The latest additions are these lip balms, available in lilac and pink. I went for the lilac option (I told you I didn’t like girly stuff) which holds a delicious vanilla balm with ever so subtle shiny pigments that catch the light. The balm itself is super smooth and moisturising, lasts a relatively long time and adds something extra to your lips so you don’t even need a gloss. All this and they’re only £1.50! Bargainous. The best thing to come out of H&M for a long time… and that includes the top I just bought that’s already shrunk in the wash.
Next Post Get your roots done!